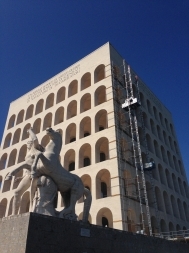 After the round colosseum is time for Maber to do the square colosseum in Rome. 2 transport platforms of 2.000 kg capacity. One twin mast MBC2300/150 and one single mast MBC2000/150-S tot high 60 m with 6 stops. These two machines are working for the 1 year renovation job of Palazzo della Civiltà Italiana built in 1935 commissioned from FENDI.